I had so much to catch up on after last week's tournament that turkey hunting was the furthest thing from my mind when I got up right after daybreak. I was buried, trying to get a million things done for next week's UMF shoot on Lake Lanier in Georgia. 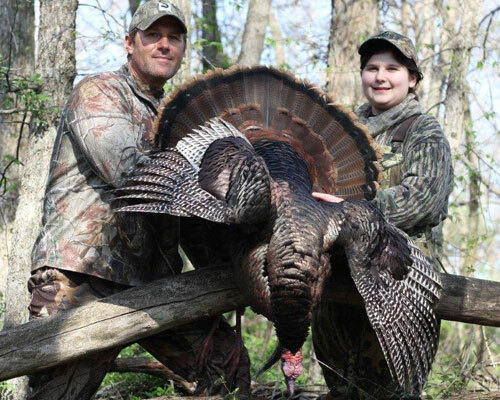 I did know, though, that Ohio's youth turkey season was open this weekend and the word around the Thomas house was that the birds had been "gobblin' their heads off" around the yard! Anyway, so I'm headed into my office (shoulda been headed to Church really) when I detoured and walked out on the back patio just in time to here a distant gobble over the hill! Enough said! Thirty minutes later I had my daughter, Reanna, staring at a big tom down the barrel of my 12 gauge. Well, all things considered, I guess I do have my priorities straight. Okay, except for missing Church. I'll work on that one!